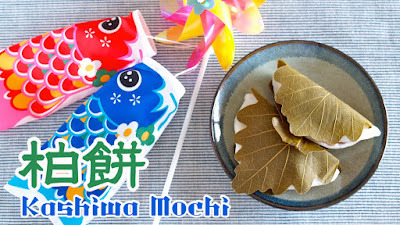 Kashiwa Mochi is a chewy smooth rice cake with Anko (sweet red bean paste) inside, wrapped in an oak leaf. Very fragrant and delicious! It is made for Children's Day on May 5th (the day we respect children's personalities and celebrate their happiness). 1. Rinse the Kashiwa leaves and pat dry with paper towel. 2. Roll Koshian into 8 balls (20g each). 3. Place Joshinko, sugar, and water in a microwavable bowl and mix well. 4. Cover with plastic wrap and microwave at 600 watts for 5 minutes. 5. Transfer to a Ziploc bag and knead until just combined. 6. Remove from the Ziploc bag and knead again with your hands moistened with water until smooth. Then divide it into 8 pieces. 7. Roll out the Mochi between plastic wrap to make a flat oval shape. Place Anko and fold to cover. Seal the edges tightly. Then wrap with Kashiwa leaf to finish.